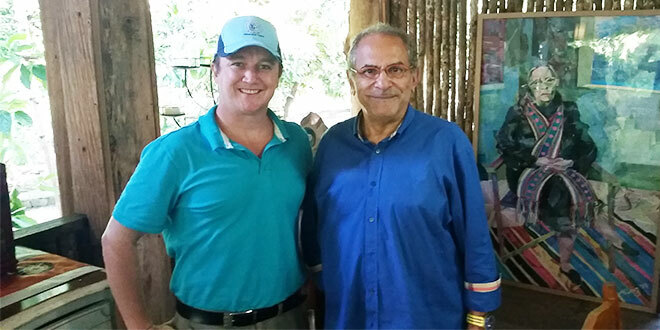 Helping veterans: Timor Leste’s former prime minister Jose Ramos Horta and Michael Stone, who is principal guide for the Timor Awakening program. HUNDREDS of Australian veterans are expected to travel to Timor Leste as part of a unique rehabilitation program with spirituality at its core. The 12-month program, called Timor Awakening, is taking aim at a “health crisis” amongst young Australian veterans, who suffer from a frightening suicide rate. RSL Queensland has sponsored the program, which will provide holistic health care for 200 Australian veterans. It will include an 11-day Timor Leste trip during which the Australian vets will visit sites of historical wartime interest, and team up with Timorese veterans and their families. “This has all come about because RSL Queensland wanted to give veterans a more comprehensive rehabilitation program,” Deacon Gary Stone, who is chaplain to the ex-service community in Brisbane archdiocese, said. The Veterans Care Association, with Deacon Stone as president, has planned carefully to include an 11-day Timor trip into the year-long rehabilitation program. Last month, Deacon Stone’s son Michael Stone, a former platoon commander in 2RAR, travelled to Timor Leste to make final arrangements and obtain official backing for the program. Mr Stone will serve as the principal guide during the Timor Awakening program. In Timor Leste, Mr Stone met the current military leaders and former president and prime minister Jose Ramos Horta. Mr Stone worked as senior advisor to Mr Ramos Horta during his prime ministership. The first “deployment” of about 20 veterans to Timor Leste is scheduled for July, and a second will follow in September. Veterans will visit key sites of Australian military involvement from the Second World War resistance by Australian commandos against the Japanese, through to the Timorese resistance led by Falintil against the Indonesian military, and United Nations intervention from INTERFET through to the present day. It will include visits in and around Dili, Batugade, Motaiin, Balibo, Maliana, Tonabibi, Bobonaro, Aidabeletan, Baucau. The Timor Awakening program is a collaboration with the fledgling Timorese veteran community. It is also aimed at enhancing the broader relationship between neighbouring countries. About 120 Timorese veterans and their families are expected to take part, underlining a special and enduring relationship they have with Australian soldiers. “Many of our young veterans have an emotional connection with Timor,” Deacon Stone said. “The vision and primary purpose of the Timor Awakening program is to raise the holistic health and wellbeing of veterans and their families. “Veterans are attempting and committing suicide at twice the rate of the general community. Deacon Stone is a strong advocate of holistic intervention. “People are reaching out for hope,” he said. “I’ve had two suicide interventions in the last two weeks. “In both cases the former soldiers had tried medication, had tried counselling. “I can offer them the love of God and the compassionate care and companionship of a group of veterans who have experienced the darkness, but have embraced the Light of Christ to get them through it. Timor Awakening is open to all who have served in the military, whether overseas or in Australia. Expressions of interest for the July and September intakes are available at www.veteranscare.com.au. Applications for the first two programs are to close on May 1. Next: What exactly is an annulment?